Notebookcheck reported back in February that Asus is planning to expand its Republic of Gamers (ROG) portfolio with the addition of two high-performance models. If you are looking for a gaming laptop, you might want to check out the newly (and now officially) launched G75VW and G55VW portable computers that the manufacturer describes as “the ultimate fighting machines”. Pricing will reportedly vary from country to country but customers should be prepared to fork out about $1,500 for the powerful notebooks. According to the maker, the 15.6-inch G55VW and the 17.3-inch G75VW pack a 3rd generation, or otherwise known as Ivy Bridge, Intel central processing unit. Apparently, the laptops will be equipped with up to an Intel Core i7-3720QM chip that incorporates four cores operating at a frequency of 2.6GHz (which goes up to 3.6GHz with Turbo Boost) and the integrated Intel HD 4000 graphics card. Furthermore, the new ROG notebooks sport Full HD widescreen displays and the bigger G75VW can be purchased with optional 3D Active shutter glasses that use NVIDIA’s 3D LightBoost technology (in 1080p resolution). Other features include an NVIDIA GeForce GTX 670M GPU with 3GB of dedicated GDDR5 VRAM, up to 16GB RAM, a 750GB HDD (or dual hard drives paired in RAID 0/1), four USB 3.0 ports and an HD web camera for video calls. 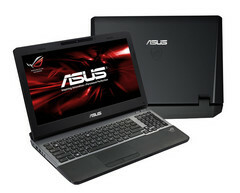 You can also read out extensive review of the Asus G75V here.